(AP) The NAACP is calling on Mississippi legislators to remove the Confederate battle emblem from the state flag, days after South Carolina removed a stand-alone Confederate banner from its Capitol grounds. 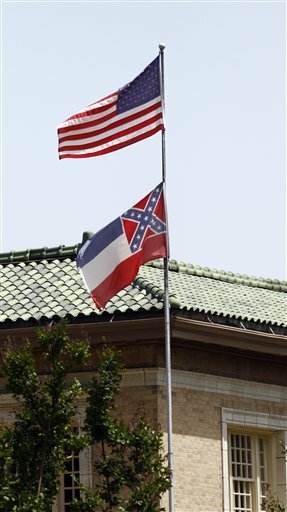 “The state of Mississippi now remains the sole state in our country to embrace a symbol of war, hate and a failed attempt to perpetuate its right to slavery, into its flag while regarding it as ‘heritage,’ despite inflicting degradation upon its citizen descendants of slaves,” the civil rights organization said in a resolution it adopted Tuesday at its national convention in Pennsylvania. Old South symbols have come under fresh scrutiny since the June 17 massacre of nine black worshippers at a church in Charleston, South Carolina. The man charged in the slayings had posed with the Confederate battle flag in photos posted online before what police said was a racially motivated attack. Mississippi has had the same flag since 1894, and during a statewide election in 2001, voters decided by a nearly 2-to-1 margin to keep the Confederate emblem on the banner. Curley Clark, president of the Moss Point-Jackson County chapter of the NAACP, said in an interview Tuesday from the national convention that the Confederate symbol may represent heritage to some Mississippians, but “it represents racial oppression, racial bigotry, hatred, things like that” to the state’s residents who aren’t white. “If Mississippi is going to unite and be one Mississippi — not a white Mississippi and a black Mississippi, but one Mississippi — that flag needs to be changed to remove that divisive symbolism of the Confederacy and replace it with a unifying symbol that can be revered by everyone,” Clark said. Mississippi elected officials are divided on whether to reconsider the flag design. Days after the Charleston slayings, Mississippi House Speaker Philip Gunn became the state’s first prominent Republican elected official to call for removing the Confederate emblem that he said is divisive. Republican Gov. Phil Bryant and Lt. Gov. Tate Reeves have said they stand by the 2001 election results. The NAACP resolution says legislators should change the flag because the 2001 election showed that black voters are “obviously outnumbered and therefore voiceless” in trying to change the flag. About 37 percent of Mississippi residents are black.